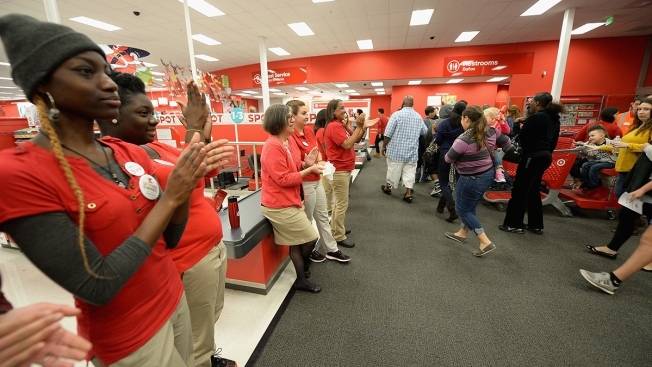 Target also said it will have a new, mobile checkout option in stores this year to allow rushed shoppers to "skip the line"
This Nov. 27, 2014, file photo shows guests shopping for Black Friday doorbuster deals at Target in Miami, Florida. Target will open at 5 p.m. Thanksgiving and close at 1 a.m., then reopen on Black Friday at 7 a.m.
Target on Thursday said it will open its doors earlier on Thanksgiving this year, as it expects throngs of shoppers to head to its stores across the U.S. after an early turkey dinner to shop its deals. The retailer will open at 5 p.m. on Thanksgiving and close at 1 a.m., then reopen on Black Friday at 7 a.m. Last year, Target opened at 6 p.m. on Thanksgiving. Kohl's and Macy's also have announced plans to open at 5 p.m. on Thanksgiving this year, sticking with what they did in 2017. On past holidays, "we've had lines outside our stores across the country," a Target spokeswoman told CNBC. "In fact, some guests show up hours in advance of opening. That tells us there's a desire from our guests to start their holiday shopping earlier." Target also said it will have a new, mobile checkout option in stores this year to allow rushed shoppers to "skip the line." Walmart announced a similar program earlier this week. Target workers will have handheld devices to help scan items and speed transactions from anywhere in the store. It said it expects to use this service for bigger items, like electronics. Target late last month already laid out much of its strategy to woo shoppers this holiday season. That includes offering free, two-day shipping with no minimum purchase required, something it's never tried before. Walmart is keeping its $35 threshold for free shipping during November and December. Many companies are still opting to stay closed on Turkey Day this year to give workers time off with their families.